Meigs freshman first baseman Andrew Dodson (30) waits on a underhand throw by teammate Tyler Tillis (2) during the fifth inning of Monday night’s TVC Ohio baseball contest against River Valley in Bidwell, Ohio. BIDWELL, Ohio — An unfitting end to a classic pitcher’s duel. 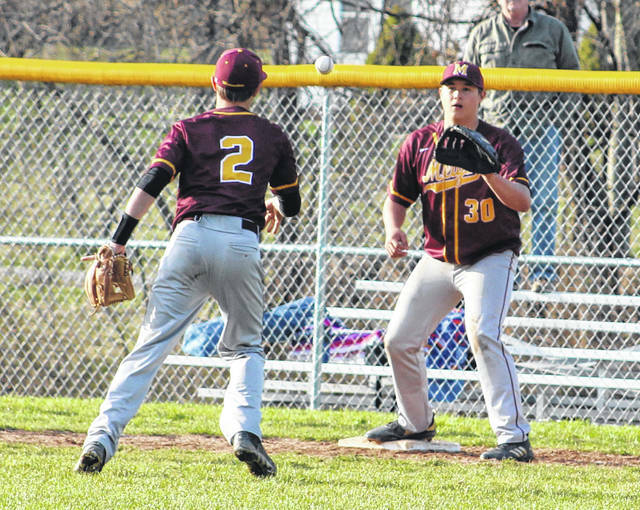 The Meigs baseball team produced its only hits during a four-run top of the ninth, which ultimately provided all the needed offense during a 4-0 decision over host River Valley on Monday night in a Tri-Valley Conference Ohio Division matchup in Gallia County. The visiting Marauders (2-1, 1-0 TVC Ohio) were held hitless through eight innings as RVHS starter Chase Kemper was masterful, allowing only four walks while striking out seven over that same span. The Raiders (0-4, 0-2), however, caught an unfortunate bounce in the top of the ninth as Kemper issued a leadoff walk to Cory Cox, then Wes Smith followed with a bunt single that put runners at first and second. Cole Arnott laid down a bunt in front of home plate that was fielded by first baseman Andrew Mershon, but Mershon’s throw to first base sailed wide of the target and trickled into left field. Cox and Smith both ended up scoring on the error while giving MHS a 2-0 edge. Kemper was pulled at that point and replaced by Cole Johnson, but Meigs answered as Briar Wolfe reached on an error that allowed Arnott to score for a 3-0 contest. Wolfe later came around on a single by Andrew Dodson for a four-run cushion headed into the final half-inning. The Silver and Black — who stranded baserunners in scoring position in the second, third, fifth and seventh frames — went down in order in the ninth, allowing Meigs to sneak away with the four-run triumph. River Valley outhit the guests by a 6-2 overall margin and also committed only two of the five errors in the contest. The hosts stranded seven runners on base, while the Maroon and Gold left only three on the bags. Wolfe ended up being the winning pitcher of record after allowing three hits and a walk over five scoreless innings of relief. Wolfe also fanned six in the decision. Kemper took the tough-luck loss after surrendering three runs, one hit and five walks over eight-plus frames while fanning seven. Smith and Dodson had the lone safeties for Meigs. Dalton Mershon, Andrew Mershon, Chase Barber, Joel Horner, Wyatt Halfhill and Blaine Cline each had a hit apiece for River Valley in the setback. Meigs returns to action Wednesday when it hosts Athens in a TVC Ohio matchup at 5 p.m.
River Valley heads to Nelsonville-York on Wednesday for a TVC Ohio contest at 5 p.m.
https://www.mydailyregister.com/wp-content/uploads/sites/24/2019/04/web1_4.3-MHS-Dodson.jpgMeigs freshman first baseman Andrew Dodson (30) waits on a underhand throw by teammate Tyler Tillis (2) during the fifth inning of Monday night’s TVC Ohio baseball contest against River Valley in Bidwell, Ohio.